The children did brilliantly this week with their carol concert.Thank you so much for supporting them. They worked very hard to learn all words to the songs and it is quite a skill to be able to sing along with a piano. We are very proud of all of them. It has been a busy term and the children have worked very hard and totally deserve a well earned rest! We were sad to say goodbye to a couple of Squirrels today, but wish Ben and Fletcher all the very best with their new adventures in their new schools. We will miss you. Thank too for all your lovely cards and presents that you have given us. We are so thankful for your generosity and kind wishes. We hope you all have a fantastic Christmas and some special family time together. Looking forward to seeing you back on Tuesday the 8th of January. We are very lucky in our school, that we have Mrs Boulter, who is our resident artist. Each half term she works with a different class on a pottery project and this half term it was our turn. Squirrels have made beautiful Christmas angels. They have cleverly used different objects to create patterns and prints in their clay and thought carefully about the glaze they wanted to use. It has been a very arty week and we have also been busy weaving. This has taken a serious amount of perseverance but I think you will agree they look brilliant! Here are some examples of our work. Squirrels have created some beautiful snowmen pictures this week. Look at the way they've created their backgrounds using tissue paper in different shades of blue and used snowflake sequins to give that extra bit of sparkle to their winter sky. Here are a few examples of the children's work. Using clues to find our new Christmas topic. Discussed advent and created our own class calendar. Today we started our new topic! It began with a hunt around the playground for clues. We found 6 pictures with a secret word which connected them together. After lots of hunting and a bit of thinking, we'd got it! A snowflake, a hat, a scarf, a carrot, some stones, some sticks ... a snowman!! Our new topic is The Snowman. We can't wait to learn more about the story! We have had a fab week in Squirrels thinking about all our values. Highlights of the week include new responsibility teams in class; including energy monitors, librarians and respect police! We also enjoyed exploring famous scientists and how their curiosity changed the world. We also thought about how we can step into other people's shoes and think about how they are feeling. As well as completing some very tricky challenges that needed a lot of perseverance, such as untying a very knotted piece of string, trying to complete a 0-1000 dot to dot and building card houses. Phew! The children have been brilliant and we have very much enjoyed listening to their ideas and suggestions and watching them face those tough challenges positively. Well done Squirrels! They finally enjoyed some nice calming activities at the end of the week, learning different ways to relax. Practising inverse + and – number sentences. Learning the importance of being quiet and calm to help us relax and deal with worries. Preparing and writing a presentation about our houses. Our lovely 'Squirrel Borrowers' have been super busy designing and building their own rooms. They have practised a whole variety of skills to wall paper their walls, build and make their own furniture and add lovely details and home comforts to their rooms. Here are a few examples of their work. bunk beds and a ladder. coat hangers and clothes in a wardrobe. a nicely sewn duvet cover and pillow. a disco room with dance floor. a tiny book on a table. Practising our jumping skills and landing on 2 feet. We have been learning all about different materials in science and today Squirrels have been scientific investigators! We planned out an investigation to see which fabric would make the best pair of trousers. We thought carefully about what we needed to do, what we needed to keep the same and what we needed to change. We listed the equipment and made a prediction. Then came the fun bit - testing it out! We wrapped each fabric in turn around a rock and rubbed it on the ground outside until a hole appeared. It was great fun and we discovered that denim is a very durable fabric. Have a look at our photos! Drawing arrays to solve multiplication calculations. Continuing to build our rooms in DT- adding details and thinking about how we can change things to improve them. Doing yoga and practising our hopping and jumping skills in REAL PE. Last Friday our school took part in 'Red, white and blue day'. This was a special day to celebrate the 100 year anniversary of the end of World War one. The children in year 2 enjoyed taking part in different activities including learning about the Union flag and creating their own using different art techniques; learning how to march to a beat with Mr Ridgeway and to stand to attention, as well a a variety of other activities such as paper aeroplane making and learning about the countries of the world. Mrs Rogers brought in a special instrument called a flutina squeeze box, that belonged to her great great grandfather who fought in World War 1. We talked about the importance of singing to keep soldiers spirits up and to help people feel positive .The children learnt a song called 'It's a long way to Tipperary'. We finished the day with a special assembly lead by Les, from the charity ABC to read, who was an RAF pilot. He shared his experiences and knowledge of planes and brought in his special models for us to see. On Thursday Squirrels enjoyed their trip to Bekonscot model village. The children were challenged with a pretty tricky mission to find their way around and find answers to questions about life in the model village. They did a brilliant job and used excellent observational skills. We took part in a workshop in the afternoon and pretended to shrink down into tiny 'Borrower size' and we found out about how homes have changed. We hope the children are inspired to build their own model rooms this week and include lots of details. The children and staff would like to say a very big thank you to all the lovely parents and governors who were able to support us on the day. We couldn't have done the trip without you and are grateful for giving up your time to help us. learning how to march to a rhythm. Over the last few weeks Squirrels have been learning about Christian religious symbols in RE. The children have made some beautiful stained glass windows. They are up on our windows so feel free to walk around the outside of the school to the classroom to have a look! Squirrels we need your help. Next week we will begin making our special tiny houses. Please don't forget to bring in a box (shoe box size is ideal) but also if you could collect anything that you could make into small pieces of furniture, that would be brilliant! It would be a good idea to keep all your special things in a named plastic bag. If you could bring them to school on Monday 1st October that would be lovely! Today in P.S.H.E. 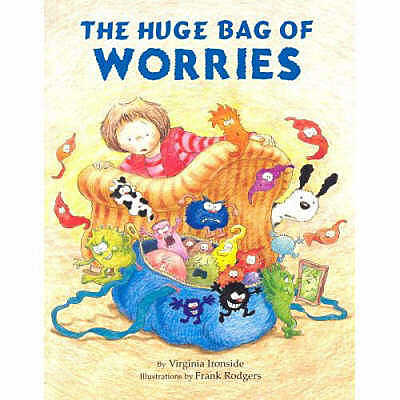 we read a great story called 'The Huge Bag Of Worries’, by Virginia Ironside. It is about a girl called Jenny who worries about things. In fact she keeps her worries in a big blue bag and the bag just keeps on getting bigger and bigger until she meets her kind neighbour who encourages her to open that big bag and share her worries with her and sort them out. I worry about the dark. I worry about having bad dreams. I worry that I might get an answer wrong. I worry that I might not get on with my new class mates. We have encouraged the children to share the worry they have chosen, with you at home too. Practising our English skills in Read Write Inc. Creating our own 'Borrower' characters and writing about them. It was great to meet you at the Squirrels class meeting last week. Again huge apologies that Mrs Rogers was unable to be there. For those who were unable to attend please see the link to our power point presentation below. If you have any questions please do come and speak to one of us. It's really important to us, that we work together with you to do the best for your children. Using commas in a list, full stops and capital letters when writing about different rooms. We have had an exciting start to our new topic - A Hidden World! After receiving a letter from Arietty (one of the Borrowers), we bravely set off on a mission to discover them in the wild garden. Our quiet footsteps and undeterred hunting paid off as we found lots of miniature hidden doors. We imagined what might be behind each one and what the hidden world might be like. 6.9.18 At the end of each week, we will post a weekly review of all the learning we have been doing in Squirrels class. Finding out interesting facts about squirrels and writing statements and questions using correct punctuation. Counting in 2's 5's and 10's. Creating our own self-portraits using pastels. Making squirrel masks practising cutting skills. Welcome back. We hope you have had a wonderful summer holiday. Squirrels have had a fantastic first day back today and are back in the swing of school routines. We have created our class charter, thinking about our rights and responsibilities. All the children have signed our charter to promise that they will try their hardest to keep our class rules. A paper copy of this will be sent home this week. Our topic this week is "All About Squirrels" and we will be learning lots about the different types of squirrels as well as each other!